e all know why the Quran was sent down to us right? To ponder and to receive it's lessons. But for many of us, the Quran is the only book we do not actively think about. Do we think how every ayah change us as a person? How every ayah can teach us a daily life lesson? 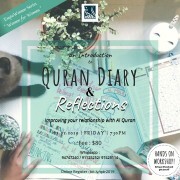 Or is it just a display set we place on top of our shelves to protect us from evil and to trap dusts of which we clean only when Aldil Fitri is nearing? Occassionally we come across ayah which shake us and move us to action but it never seems to last long. We come closer to and move away from the Quran all the time. Now there's something you can do which will take you 5 minutes each day that insha allah will bring back the Quran to your daily life. When faced with hardships, many of us tend to text a loved ones and start blasting over how bad your day went, some might even keep a journal or a diary to vent all your emotions. A diary that only you can read and be completely honest with. But have you ever thought about writing it to the one? The all knowing, the all hearing, the creator? 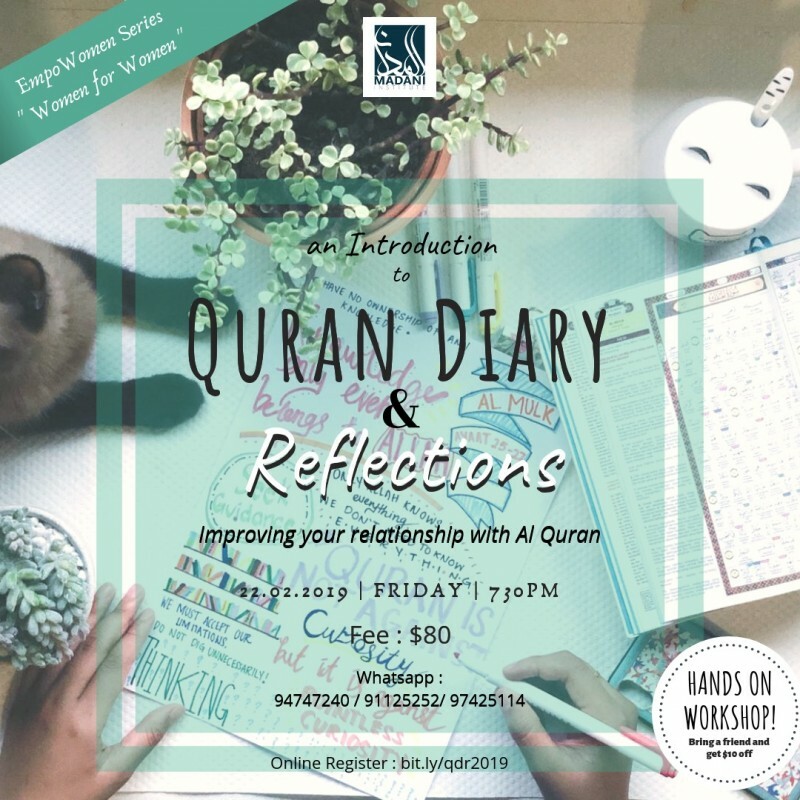 Quran Diary and reflections is a workshop designed for women from women so as to improve your relationship with the Quran and ultimately with Allah Swt. What it takes is just 5 minutes each day. So join us in our journey to becoming a better ummah.